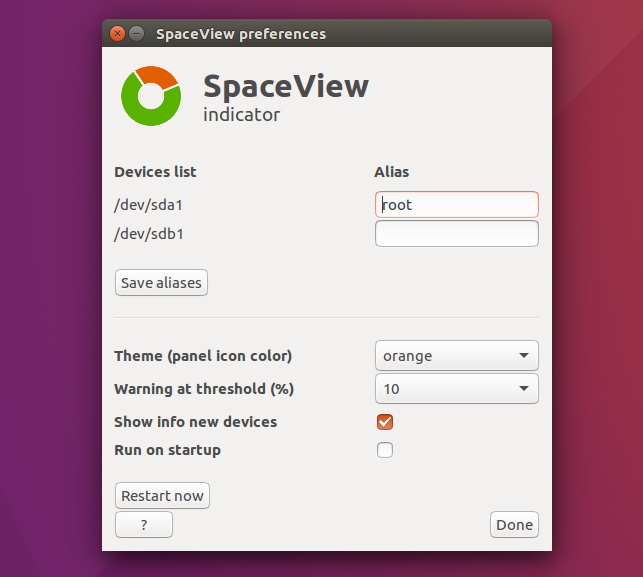 SpaceView is an Ubuntu indicator which displays the file system usage, created as a response to an AskUbuntu question. The AppIndicator displays a list of devices in its menu, and clicking on any of them sets it as default, displaying its free space directly on the panel. From its preferences, you can assign an alias to each device, select the panel icon color, or set the warning threshold (when the free space reaches the threshold, a warning is displayed). Other features include an option to show the usage of freshly connected devices as notifications, and an option to start SpaceView on startup. After changing any settings from the SpaceView preferences, click the "Restart now" button or else they won't be applied until the indicator is restarted. I should also note that I encountered an issue with SpaceView. The indicator may display loop devices in the indicator menu, and you can't filter them out, along with the "Check your disks" message on the panel (because loop devices have 0% free space). This issue has been fixed with SpaceView 0.5.5. Alternatively, you can manually download the deb from HERE. Report any issues you may find @ Launchpad.